In Christian Devotedness, A.N. Groves expounds the Lord Jesus' teaching concerning stewardship of material possessions, exhorting all Christians to trust God to supply their needs. “Do not lay up for yourselves treasures on earth, where moth and rust destroy and where thieves break in and steal; but lay up for yourselves treasures in heaven, where neither moth nor rust destroys and where thieves do not break in and steal. For where your treasure is, there your heart will be also.” Matthew 6. A.N. 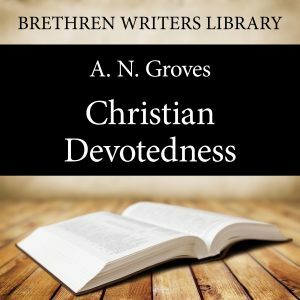 Groves put into personal practice the principles of Christian devotedness which he advocates in this booklet, and proved the possibility and blessing of accepting the teaching of the Lord literally. This booklet had a major impact upon George Müller (who married Groves’ sister Mary), and through him on James Hudson Taylor and many other significant Christian figures. A word about the author: Anthony Norris Groves ( 1795 – 1853) was born in Hampshire, England and was the only son in a family of six. Having trained as a dentist in London, he set up practice in Plymouth. He had a zeal for missionary work and although he felt led to go to India, in 1829 Groves and his wife Mary set out for a mission to Arabic-speaking Muslims in Baghdad, Iraq together with their two young sons, Henry and Frank, and accompanied by several Christian friends. There in March 1831 Groves suffered the death of his wife and a recently born baby daughter. He returned home to England and in 1833 he visited India and returned there again in 1836 with his second wife Harriet Baynes. He continued preaching and teaching in India until ill health forced him back to England in 1852. He died the next year. He considered his life a failure, and did not live long enough to see the worldwide impact of his ideas and example on a new generation of "faith missions" springing from the 1859-60 Revivals. He has gone down in history as the "father of faith missions". This book is part of the Brethren Writers Library series. These books go forth with the purpose of introducing the listener to the writings of men who were gifted of God as teachers ‘for the perfecting of the saints, for the work of the ministry, for the edifying of the body of Christ’. We pray that the rich mine of spiritual truths in their writings may be opened up to you that you may be built up in your most holy faith.